I’ve undergone a transformation. For most of my life I thought of short stories as the second-class citizens of the reading world. Why read a short story anthology when you could pick a thick book that would keep you reading the same story for hours? I wanted epic stories, the longer the better. Things have changed since those days. I don’t have hours-long blocks of time to spend immersed in a book (unless I want to stay awake all night and then deal with a reading hangover at work the next day). Instead, I have a twenty-five minute bus commute, a fifteen minute lunch, one hour before bed. In those moments, a brief, vivid story is sometimes all that I can digest. And an anthology, created to collect related short stories or novellas, is the perfect solution. It is this change in thinking and change in reading habits that led me to list ‘read more short stories’ as one of my goals for 2013. 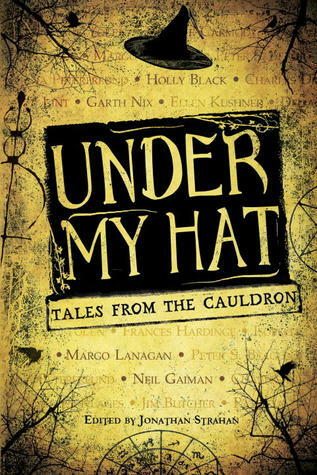 And I did just that by picking up Under My Hat: Tales from the Cauldron, edited by Jonathan Strahan. Under My Hat is one of the strongest anthologies I’ve ever read. Usually there are a couple of excellent entries, a few that register as fair, and one or two that are simply mediocre. The quality of this anthology was ‘good and/or great’ across the board. The theme, of course, is magic. Specifically, magic that requires a hat: witchy magic. Strahan gave the authors some flexibility within that theme, but all of the stories have a connection to the central motif. Even within a strong anthology I had my favorites, and the mini-reviews for those stories follow below. Payment Due by Frances Hardinge – When an unwelcome intruder takes the things that matter to a girl and her grandmother, something must be done – and it may be a bit… unnatural. I have never, to my knowledge, read Frances Hardinge before. I will remedy my ignorance posthaste, because this little story was not only about revenge and magic, it also managed funny, tragic, menacing, and heartwarming all in one go. A Handful of Ashes by Garth Nix – A school bully awakens old magic that should have remained buried, and it’s up to a few intrepid student witches to protect their lives and outwit the other side. It doesn’t surprise me that a Garth Nix story should be one of my favorites of the collection. Nix’s entry highlights the advantages of working hard, overcoming obstacles and paying attention to history – which are life skills too (not just magic). Which Witch by Patricia A. McKillip – Bandmates may be facing a menace blind if a crow familiar can’t communicate to and protect his chosen witch. Faceoff at show time. Though short, this story is packed with detail. Multiple character perspectives widen the scope, and while the threat is deadly, the focus is light and fun overall. Great-Grandmother in the Cellar by Peter S. Beagle – When a witch curses his sister and threatens to keep her asleep forever, a young man makes the fateful decision to dig up his great-grandmother’s bones. This story is gruesome, hilarious, (again) revenge-filled awesome. Just dark and unpredictable enough to make one shiver, while surprising the reader into laughs and an acknowledgement of the author’s skill. Crow and Caper, Caper and Crow by Margo Lanagan – Even across many miles, Pen knows it’s time for her granddaughter’s birth. The journey changes her, and her granddaughter will alter her even more. When I first read Lanagan last year I predicted that I would be coming back to her writing. Here’s the proof that I was right. The tale of this woman’s journey and choices is beautiful, haunting, and human. In all, Under My Hat is a delicious anthology: it combines wonderful work by some of the best fantasists in the business, and brings those stories to the reader in one delightful package. It’s early yet, but I predict that it’ll be in the running for best of the year. Recommended for: fans of fantasy and the short story form, anyone who imagines magic in the everyday (or would like to), and the uninitiated reader who would like to sample the wares of some of the greatest (living) writers of fantasy. This one is on my wishlist! I actually love short stories. A good short story manages the same things as a novel, in one-tenth (or less) of the time - it takes real talent to write a good one! Thanks for this review. I also felt short stories second class to novels until I read Alice Munro. With changed opinion, I think Under My Hat sounds like a great collection and one I could get into. I hadn't heard of this anthology but it's definitely one I am interested in, especially since it doesn't seem to have any dud stories!